According to a July 2015 survey by Statista–an online statistics, market research, and business intelligence portal—24% of people stated that content was the deciding factor when it came to choosing which streaming service to subscribe to. But figuring out what content is available through what streaming service, and the plethora of apps, can be daunting and confusing. Do you need a TV subscription? Is there a free version? What can you watch on the free version versus paid? Where can you watch all your favorite shows? Both ABC® and NBC® have their own apps available for download on iOS and Android, in addition to a variety of other devices, like Roku, Apple TV®, Amazon Fire®, and XBox One. The NBC streaming TV app is also available on a number of other devices, such as XBox 360 and Samsung Smart TVs while ABC is available on Android TV. 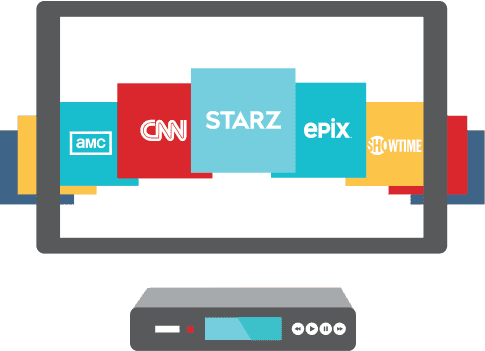 If you don’t have a subscription to a TV provider like FiOS® TV from Frontier or DISH® TV, both ABC and NBC limit what you can stream. NBC lets you watch the latest episode of a new series, and any three locked episodes for up to one month, for free. And, generally eight days after airing, most episodes are unlocked. ABC offers more for free, including full seasons of hit shows like Brothers & Sisters, Felicity, Ugly Betty, and School House Rock. Its free streaming app also includes ABC Originals which are comedy and lifestyle digital series that include shows from well-known names like Ty Burrell and comedian Iliza Shlesinger. For both ABC and NBC, if you want full access to the latest season, the newest shows, and generally all their content, you must login with your pay TV subscription credentials. The FrontierTV app, which is included with your Frontier subscription, gives you access to both ABC and NBC. With the CBS® app, you have two different streaming options: its free streaming service, and CBS All Access. You get access to primetime, daytime, and late-night episodes in HD the day after they air with its free app, and can view its primetime schedule. You can also access CBS streaming content via the FrontierTV app (Apple, Android). If you want to watch past episodes, stream live TV, or check out CBS All Access Original programming, then you need to subscribe to CBS All Access. There is a commercial free as well as a limited commercial option. CBS All Access is available on many platforms, including iOS and Android devices, PlayStation 4, XBox One, Google Chromecast, Roku, and Amazon Fire. While the Watch ESPN® app is free to download for iOS and Android, you need a TV subscription that includes ESPN in order to stream content. If your TV subscription includes ESPN, the floodgates are wide open. You get access to live sporting events like Monday Night Football®, college football and basketball, major league baseball, golf, even ESports and shows like Sports Center and Baseball Tonight. It doesn’t stop there. You also get access to ESPN’s sister stations like ESPN 2, ESPN News, SEC® Network and SEC Network+, Longhorn Network, ACC Network Extra, ESPN Goal Line, ESPN Buzzer Beater, and ESPN Bases Loaded. With a TV subscription that includes ESPN and the Watch ESPN app, you’ll never miss a play, a trade, or sporting development. Netflix® is a stand-alone subscription service, so you don’t need a TV subscription to access its content. You can stream movies and TV shows, but not live TV. It does require a fast, reliable Internet connection. It’s accessible through the Netflix app from both iOS and Android, as well as laptops and desktops, smart TVs, PlayStation 4, Xbox, Chromecast and even Blu-ray players. It also comes integrated into platforms such as FiOS Quantum and Vantage™ TV by Frontier. There are three pricing tiers and the difference between the tiers has to do with whether HD content is available, or Ultra HD (think 4K), and the number of devices from which you can stream content at once. For the basic tier, you can watch on one screen at a time and there is no HD or Ultra HD content available. For the standard tier, you can watch on up to two screens at once, and access HD content while the premium tier gives you access to both HD and Ultra HD content, and lets you watch on up to four screens at once. Hulu®, like Netflix, is a stand-alone subscription service and requires a fast, reliable Internet connection connection to stream content. A big difference is that Hulu not only lets you stream movies and TV shows that have already aired, but also the latest episodes and new shows from network TV. Hulu is accessible on a variety of platforms and devices, including iOS and Android, Apple TV, Roku, Chromecast, PlayStation 4, Xbox One, smart TVs, and Blu-ray players. There are two subscription options for Hulu: limited commercials or no commercials. Both include available HD content, and the ability to add Showtime® for an additional monthly fee. While you don’t need a TV subscription, you do need a fast, reliable Internet connection. VUDU is accessible from a variety of Internet-connected devices, including smart TVs, smartphones, tablets, Roku, Chromecast and gaming consoles. Have any questions? Call one of our Customer Service Specialists to Learn More. Watching what you want, when you want is easiest with a TV subscription like DISH®, FiOS from Frontier or Vantage™ TV by Frontier. If you subscribe to DISH, you also get access to the DISH Anywhere app. Available on iOS and Android, this lets you watch every channel you watch at home, including live sports and news. It also lets you manage your DVR from almost anywhere, set recording priorities, and delete what you’ve already watched. The FrontierTV app comes with FiOS from Frontier and Vantage TV by Frontier subscriptions, and is available on iOS and Android. This lets you watch live TV, check scheduling, and access Frontier’s growing library of On Demand TV shows and movies. In case that’s not enough, the FrontierTV app also gives you access to ABC, NBC, and CBS so you don’t need to download additional apps. Plus, you can watch other channels, like CNN, National Geographic, MSNBC, and more.